"Solar..it's for Everybody!" - The US Solar Institute. Say each panel is a 185W module, the 12-module solar array would give the family total 2.22kWp of sun power. Enough to power up small appliances during the day and quick enough to charge storage battery for night use. Juice should be good to last the night watching their favourite satellite channel. Wished that was the case. But no. I got this from The US Solar Institute fb page. 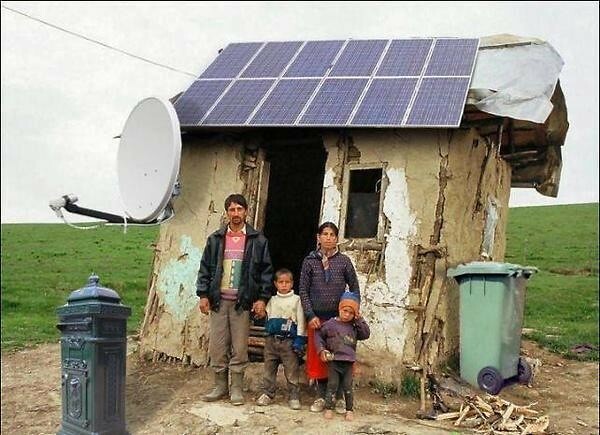 Obviously the photo was photoshopped, but I think US Solar Institute got the message through - solar is for everybody. I mean...the sunshine. Happy weekend, enjoy the London Games. Watched Italy beat the United States by a single point (219 - 218) to take the Gold in archery, Men's Team event. AVCr8teur - yes it is, save for the fact that the pic has been photoshopped.